The electromagnetic pulse. It's the big, bad boogeyman of the electronic age where we depend on a constant stream of communication and connection. Everything stops – instantly. EMPs are often used in pop culture (particularly any time Magneto wants to take over the planet) to caused widespread destruction and to control a population by plunging them into a new Dark Age. What's the likelihood of such an event happening? Would an EMP do any damage at all? Let's take a look. What is an EMP and what causes them? An EMP is a sudden burst of electromagnetic radiation that follows a nuclear detonation. EMPs are not exclusively caused by nuclear weapons, but ones large enough to cause wide-scale disruptive are most likely to occur by from nuclear rather than typical chemical-based explosions. EMPs come in three different forms, classified as E1, E2, and E3. E1 pulses are by far the most devastating, and result from gamma radiation emitted from a nuclear detonation that removes electrons from the surrounding air. These electrons careen into the Earth's magnetic field and are forced down towards the planet. This process creates a very strong pulse aimed directly at the surface that carries enough strength to exceed the breakdown voltages of many electronic devices. It is very important to note that E1 pulses are only produced by a detonation that is significantly high enough in altitude in which electrons can interact with the Earth's magnetic field. E2 pulses are also caused by gamma radiation and follow within in a fraction of a second of an E1 pulse, and are akin to those produced by lightning bolts (so they would be protected by typical surge protectors). The final pulse, an E3, is different in nature from the previous two in that it results from a shifting of the Earth's magnetic field, and would continue until the magnetic field re-settled, similar to what occurs with a solar flare. If a nuclear weapon is detonated at significant altitude (30 plus miles above the surface), an E1 would be followed in quick succession by an E2 and E3, with the results of the extremely devastating E1 pulse possibly removing the protection in place for the others. The altitude necessary would mean that an EMP was the desired detonation after-event. If the detonation happens at ground level or several kilometers above ground, no E1 pulse will occur, but the E2 and E3 pulses will still follow the detonation. With the E1 portion of the pulse being the most significant contributor to an EMP attack, the payload of the nuclear weapon is less significant than the altitude of the detonation if a country or organization desired to conduct an EMP attack. In testimony to the House National Security Committee in 1997, Gary Smith, the director of Applied Physics Lab at Johns Hopkins University, spoke on the radius of devastation that would occur from a high altitude EMP. The testimony stated that a detonation at 300 miles above the surface of the Earth would result in an E1 pulse that would cover an area the size of the United States along with most of Canada and Mexico. There have been at least two series of EMP tests, Operation Fishbowl carried out by the United States over Hawaii and the K Project carried by the USSR over the skies of Kazakhstan. Both tests used high altitude nuclear detonations to create a limited E1 pulse and measured the subsequent damage, as this was a major fear in the early 1960s while both countries were in the shadow on the Cold War. Both tests resulted in the disruption in electrical systems, with hundreds of streetlights in Hawaii being blown, civilian telecommunications disrupted, and military monitoring equipment sent off scale in the process of detonating the Starfish Prime portion of Operation Fishbowl. The United States EMP Commission was formed in 2006 to survey civilian reaction to an EMP disturbance. The commission found civilian infrastructure to be woefully lacking, including healthcare systems, along with a poor vision on the military's protection against an EMP attack in the years after the Cold War. A major concern is simply that we have not really experienced such an event yet (an E1 HEMP attack), and there is not a good way to simulate such an attack on a widely distributed network. This is a tough one, as even our government admits they don't really know what would happen and they think we are woefully unprepared. I just don't find this to be a heartwarming notion. Civilization may not be sent to the Dark Ages, but there would almost certainly be significant, wide scale disruptions in power and communications until our power infrastructure could be restored. I would argue that we would certainly be living in a mid-1800s world for several days, if not weeks, with little knowledge of what was going on in the rest of the country and world. That's a scary thought – be prepared for an extended camping trip, with lots of hot dogs, pulp and ink books, and being unable to use your iPhone as a flashlight. 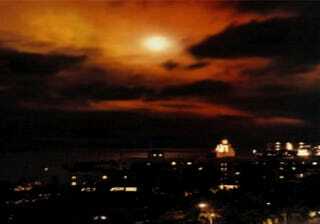 The header image is a picture of the Starfish Prime explosion taken by U.S. Military stationed in Honolulu. Other images courtesy of the Honolulu Advertiser, the House National Security Committee, and the 2010 ORNL report. Sources linked within the article.